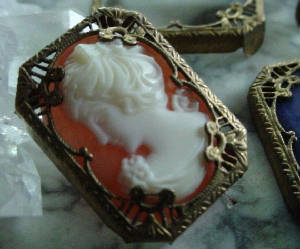 Vintage Brass 18/13 mm cameo | cabochon filigree setting with naturally occurring patina. 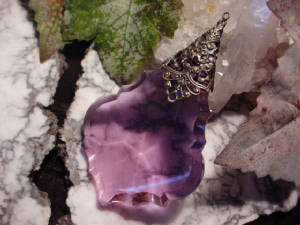 The setting prongs are located in the back. 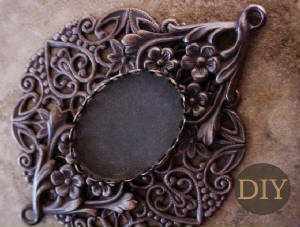 ...to our jewelry design site! 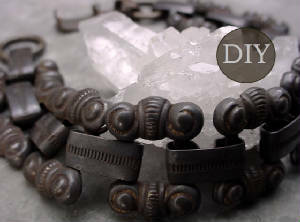 We are happy to provide this site to share our design and jewelry making tips. 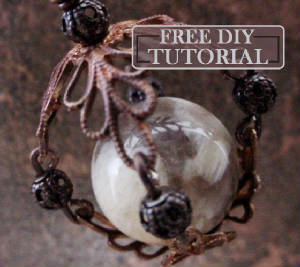 This site features "quick & easy" jewelry making with E6000 glue! You'll be creating gorgeous pieces in no time at all :) We have used E6000 for years. It is a very strong "liquid solder". After you master the basics, we also encourage you to try wire wrapping! Filigrees are easy to wire wrap as you can just "sew" pieces together through the openings in the filigress. 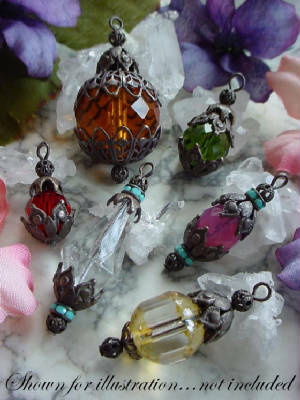 Below are a few examples of filigree wrapped designs. 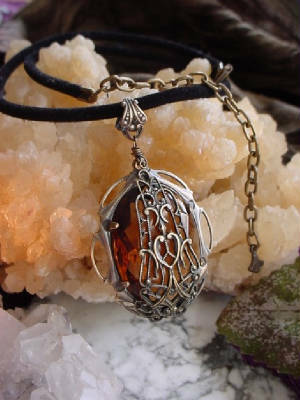 Visit the Filigree Wrapping page for instructions. My lace filigrees are available in 3 different sizes to fit stones up to 38mm. Shown here are the small lace filigrees. Notice how the top and bottom loops can be folded in or left out to make drops, connectors or focal pieces. 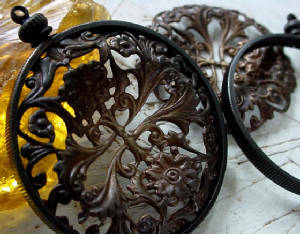 As illustrated in the above examples, filigree wrapping adds a whole new dimension to your creations. 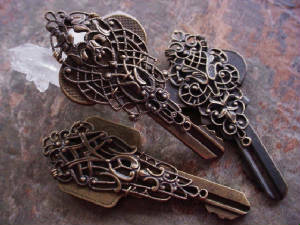 You can wrap stones, old keys, and those plain brass stampings that just need a little embellishment to bring them to life. 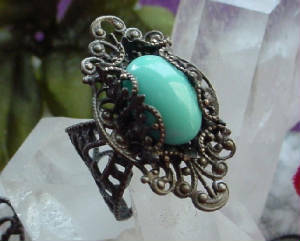 Visit the "Filigree Wrapping" page for instuctions on how to filigree wrap. Whether you have decided to explore this craft for fun or for profit, we are sure that you will get many days and years of creative fulfillment! So please, make a nice cup of tea or coffee, relax and take your time to browse these pages. You never know when one little thing may spur your imagination! While this site deals primarily with brass, you can use many of the assembly tips and technics with virtually any metal. 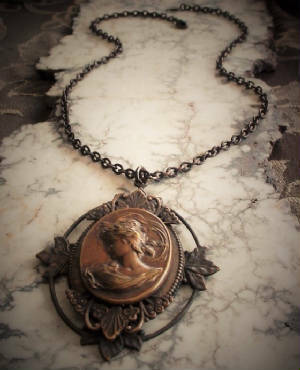 A large hand oxidized brass grape leaf pendant. No glue - no wire. Super easy. 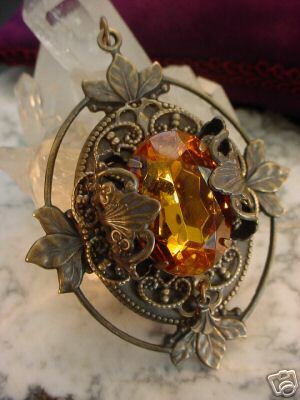 The filigree and the 10/8 fire opal stone (set in an old brass connector) are just added to the front of the leaf by hanging them on the top jump ring (top bail). See below for more glue-less design ideas. 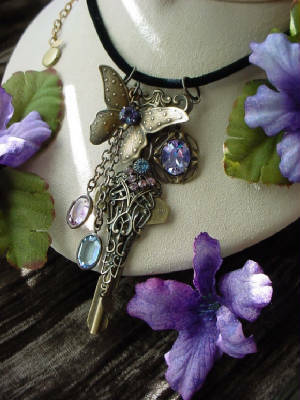 The designs below were made using jump rings and/or headpins to connect the various jewelry findings together. I like to lay out the pieces on flat surface to see exactly how they will look and fit together before assembling the design. Sometimes, you may just need a larger or smaller jump ring to make the design "work". Below. 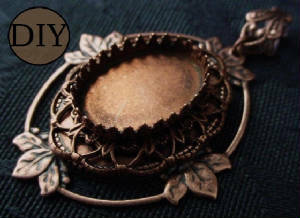 Vintage brass screw top nickel coin bezels | holders...aren't just for coins! 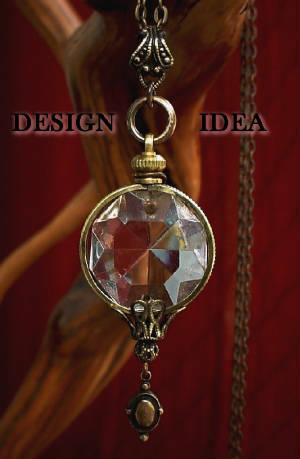 Here I used one to set an old chandlier prism (22mm octagon). This prism had two holes so I put a head pin through the top hole and brought it up the back and wrapped it around the top. Then I put a headpin through the bottom hole and brought it down to string on a nice bead cap, then made a loop the hang the little dangle at the bottom. Below. This is a top drilled crystal chandelier prism. I folded a filigree to fit the top of the prism then inserted a head pin through the front of the filigree and continued through the hole in the prism and through the back of the filigree. Then I bent the head pin up (in the back) and threaded in through to the top of the filigree and then made a loop at the top. This is a pretty large prism so I used a 3 inch headpin for this piece. As you can imagine, you can add chain and beads to openings in the front of the filigree to really make this piece a masterpiece. 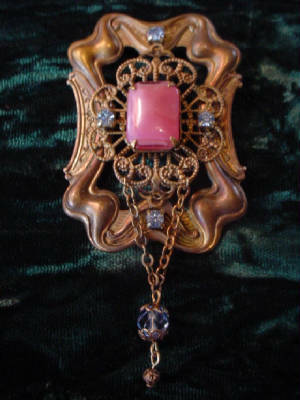 Note: If the hole in your filigree is larger than the head of your head pin, you can place a small bead cap on the headpin first to hold it in front of the filigree. Above. Vintage Swarovski Crystal turquoise navette earrings with a top vintage Swarovski Art Deco cluster. 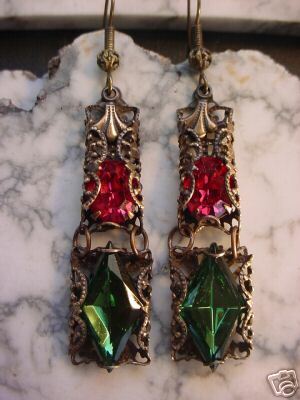 The top cluster was hung right on the earwire, in front of the filigree. Then just attach the navettes to the bottom with jumprings. Above. These beautiful and easy to make beaded drops make fabulous earrings or dangles for bottoms of pendants (or both to make matching sets). Just string your beads and bead caps on a headpin and make a loop at the top. Notice how I "stacked" different sizes of bead caps to make these drops extra special. Note: You could also cut off the head pin head and make a bottom loop to turn these into 2 ring connectors. If you would like to be put on my mailing list please enter your email address below. You will return to this page immediately after entering your email address. You'll be a pro in no time! 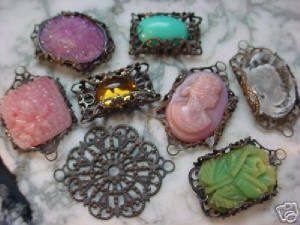 This site features quick and easy vintage jewelry crafting with vintage and hand oxidized jewelry findings. No expensive tools or equipment is needed and you can get very professional results, very quickly! !! HAVE FUN & ENJOY !! 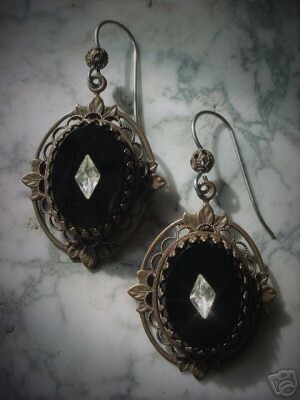 Vintage brass screw top coin holders | 39mm channel bezels with hand oxidized dark (black) patina. 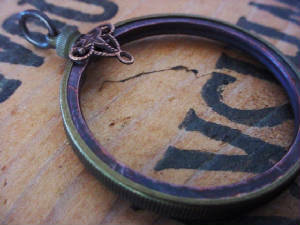 Shown with a hand oxidized two-tone brass 39mm filigree. Having over 30 years in jewelry design, we hope we can give you some easy ideas that will inspire and motivate you to explore and enjoy the wonderful world of jewelry making! 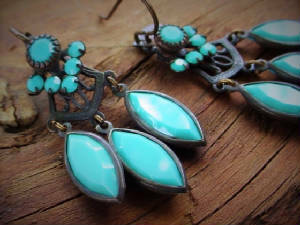 Over the years we have found jewelry making to be a fun and fulfilling craft that can be financially rewarding as well! If you are a beginner, you will find some easy instructionals to get you started right away. I also have many DIY Kits available at my etsy shop. If you are an experienced designer, I hope you enjoy browsing and find something to inspire your creations. 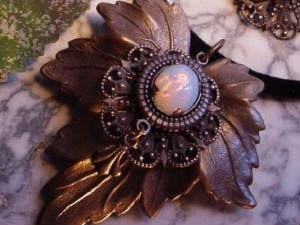 The examples below are super easy to make by just gluing together various brass jewelry findings with E6000 glue. Visit the "Just Glue It" page for instructions. Visit the "Just Glue It" page for easy instructions on making all of the designs shown above. Above are just a few of the easy to make DIY Kits I have available at my etsy shop. Also free tutorials for creating unique designs with findings you may already have on hand.